When you're 79 years old, do you think you'll be walking around 30 miles a day, six days a week? While that's probably a pretty high and maybe even a little unfair of a standard to try to live up to, that's what Don Stevenson, known as "The Pacing Parson," has been doing off and on since 1998. 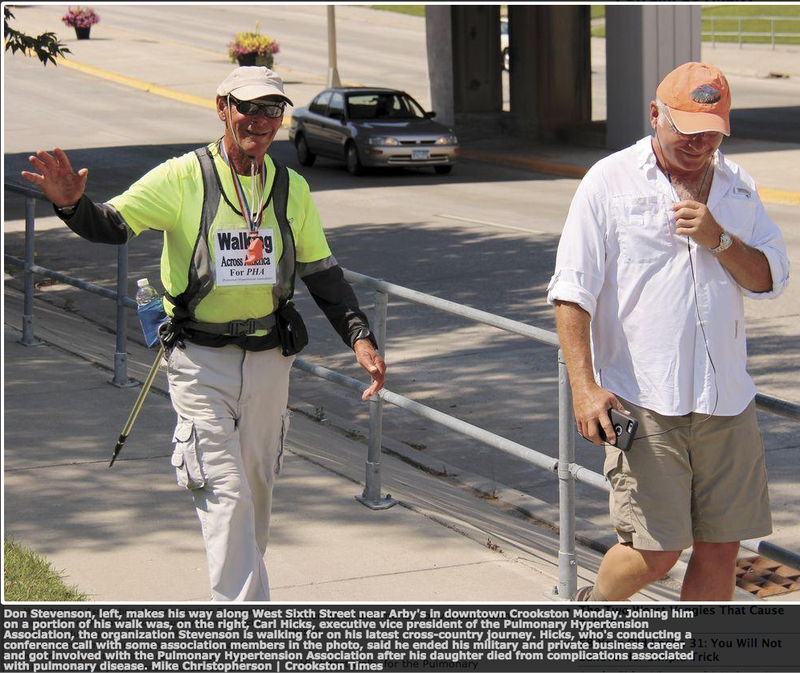 Since that time, with his wife, Loretta, serving as his support driver, Stevenson has walked across the United States to raise awareness of and money for various worthy causes. His latest walk, for the Pulmonary Hypertension Association (PHA), began in the couple's home city of Auburn, Washington in early June and won't end until they reach the national headquarters of the PHA in Silver Springs, Maryland. Monday, Stevenson made his way to Crookston. Pausing to chat while rounding the corner of West Sixth Street and North Main, Stevenson was accompanied by Carl Hicks, executive vice president of the PHA. Hicks, an officer in the U.S. Army and successful businessperson in the private sector, said he gave all of that up to join the pulmonary disease cause after complications from the disease took the life of his daughter. As he told his story, Hicks scrolled through photos on his phone capturing various points in his daughter's life. She was first diagnosed with only asthma as a child, a somewhat emotional Hicks recalled, before subsequently being diagnosed with a fatal lung disease. She outlived her life expectancy by several years before finally succumbing, Hicks said. Stevenson is a retired pastor, and during his earlier life he was also a U.S Marine, teacher, author, poet, truck driver, firefighter and emergency medical technician. He said he finds his strength to keep putting one foot in front of the other in his faith, his love for others, and his desire to serve. Since he began walking almost 20 years ago, he's logged more than 50,000 miles for a variety of causes. Pulmonary Hypertension Association: Don is currently walking from his home in Auburn, Washington to the association’s national headquarters in Silver Springs, Maryland. If you'd like to contribute to the Pulmonary Hypertension Association, visit PHAssociation.org or call 301 565-3004. To donate online, visit o2breathe.org/fightPH15. At that site, click on "Don Stevenson." To learn more about his efforts, visit thepacingparson.com.